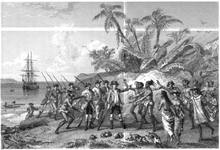 ^ https://archive.org/details/VoyageAroundTheWorldByLewisDeBougainvilleIn1766-9 |"Voyage Around The World By Lewis De Bougainville in 1766-9"
Tahiti (; French pronunciation: ​[ta.iti]; previously also known as Otaheite is the largest island in the Windward group of French Polynesia. The island is located in the archipelago of the Society Islands in the central Southern Pacific Ocean, and is divided into two parts: the bigger, northwestern part, Tahiti Nui, and the smaller, southeastern part, Tahiti Iti. The island was formed from volcanic activity and is high and mountainous with surrounding coral reefs. The population is 189,517 inhabitants, making it the most populous island of French Polynesia and accounting for 68.7% of its total population. 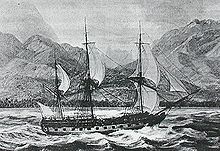 Jeanne Baret was a member of Louis Antoine de Bougainville's expedition on the ships La Boudeuse and Étoile in 1766–1769. Baret is recognized as the first woman to have completed a voyage of circumnavigation of the globe. Philibert Commerson, sometimes spelled Commerçon by contemporaries, was a French naturalist, best known for accompanying Louis Antoine de Bougainville on his voyage of circumnavigation in 1766–1769. Jacques Étienne Victor Arago was a French writer, artist and explorer, author of a Voyage Round the World. Puerto Soledad was a Spanish military outpost and penal colony on the Falkland Islands, situated at an inner cove of Berkeley Sound. Boudeuse was a 26-gun, 12-pounder-armed sailing frigates named La Boudeuse on 6 June 1765. 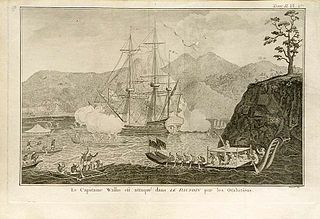 She is most famous for being the exploration ship of Louis Antoine de Bougainville between 1766 and 1769. 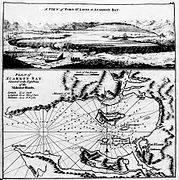 She also served in the American and French Revolutionary Wars, during which she captured two enemy vessels. She was broken up for firewood at Malta in early 1800. Antoine-Joseph Pernety, known as Dom Pernety was a French writer. At various times he was a Benedictine, and librarian of Frederic the Great of Prussia. Together with the Polish Count Tadeusz Grabianka, also influenced by the Christian mysticism of Swedenborg he founded in 1760 the secret society of ‘Rite hermétique’ or Illuminati of Avignon. The Tahitians, or Maohis, are a nation and Polynesian ethnic group native to Tahiti and thirteen other Society Islands in French Polynesia, as well as the modern population of these lands of multiracial, primarily Polynesian-French, ancestry. The Tahitians are one of the largest indigenous Polynesian ethnic groups, behind the Māori, Samoans and Hawaiians. 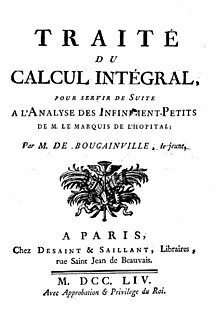 Pierre-Antoine Véron (1736–1770) was a French astronomer and mathematician. 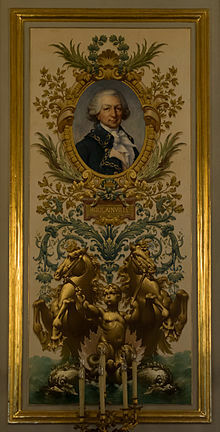 He was a disciple of astronomer and writer Jérôme Lalande at the Collège Royal. Véron is famous for having made a historical observation of the size of the Pacific Ocean. Together with Philibert Commerson, Véron was one of the main scientists that accompanied Louis Antoine de Bougainville on his voyage of exploration. He died of illness in Timor in 1770. Quessant is an uninhabited island in the Louisiade Archipelago. Politically, it is part of Milne Bay Province in southeastern Papua New Guinea. Quessant is located 30 km southeast of Wari on the northeastern border of the coastal reef. The coral island is low and covered with delicious vegetation. Three reefs are located between Quessant and the Stuers Islands, about 16 km to the northwest. Wari Island is an island in the southwest of the Louisiade Archipelago. Politically it belongs to Milne Bay Province in the southeastern part of Papua New Guinea.